It’s Christmas Eve!! A bunch of us went downtown to take a Segway tour of Austin with SegCity. I’ve been wanting to do this for a while. Friends had relatives visiting so it was a fun opportunity to take one for a ride. This is a shot of the 10 of us buzzing along south of Town Lake with some of the new skyline as a backdrop: Laura, Denyse, Chris, Irene, Lori, Dave, Tricia, Dolia, Jake and our fearless tour guide in the lead. Austin is home to the Texas State History museum. We learned recently that they admission is free on the first Saturday of each month. So a month or so ago we made plans to check it out this weekend. I have to say it was a nice way to spend several hours. The lobby of the building was being decorated to the hilt for a fancy special event. On our way out we learned that it was for someone’s wedding reception. Wow. That is going to set someone back a pretty penny. Afterwards we made pizzas at the house and played with fellow wiificionados Marty and Sue. Tonight we’re going over to Lori & Dave’s for game night. We usually end up with way too many games to play, but there’s always sure to be enough laughs (and wine) to go round. Our friends Marty and Sue were sweet to let us borrow their Wii Resort game. They showed us the Island Flyover game in which you fly a plane over an island resort to find shooting targets and pop balloons. Well. Today is Tuesday. I’m buried at work. But time has come to hang it up for the night. Monte and I aren’t what you call TV addicts. Our favorite channel is the live weather radar channel. We have taken a recent fancy to those quirky British comedies on PBS and more often than not we prefer to watch old timey movies on the classic movie channels. 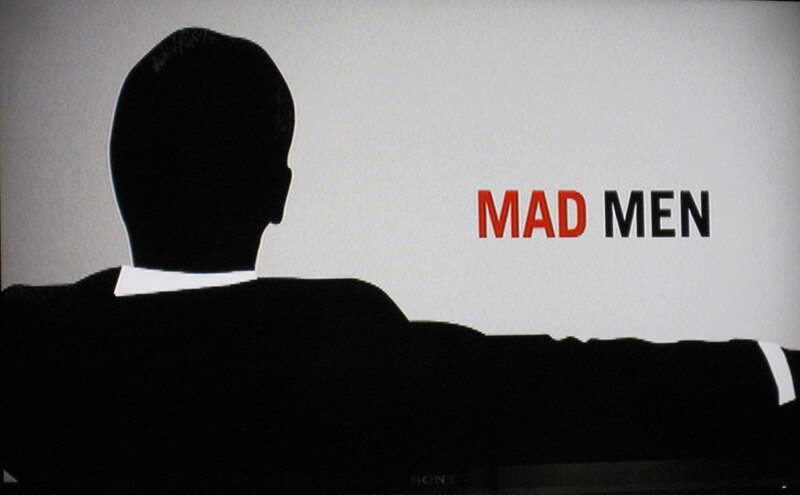 There is one primetime show that we enjoy watching together, though — Mad Men. Season 4 kicks off this weekend. We didn’t really start watching the show until last season. For his birthday I bought Monte Season 1 & 2 DVDs, so we could catch up. We had about 3 episodes left to watch, and so we had our own mini-marathon tonight to finish the DVDs before the season premier this weekend. Why am I telling you all this? Well, I left my camera in a low resolution setting from the other day. So any other shots I’d taken of pretty things looks very grainy. I did happen to capture this screen shot documenting our Mad Men marathon. So, that’s what you get for tonight. Jen and Rob invited us to go tubing with them and their niece, Channing, today. We did our traditional San Marcos River extended float. We go farther downstream past the official take out point where we park a car and trailer ahead of time to haul tubes and tubers back to the starting point. That way we have a 3 hour float. 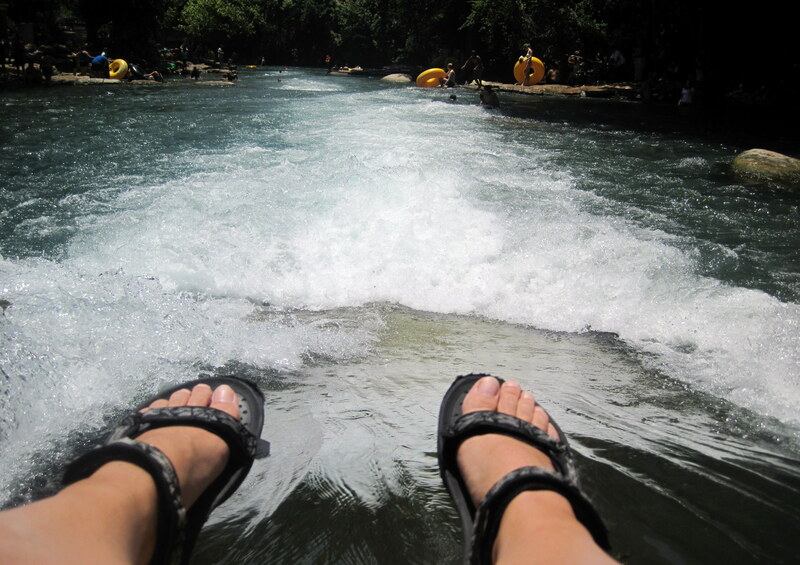 It hasn’t hit 100 degrees yet this year, so it’s a little unusual for us to go tubing until triple digit temps. But we had a fun time. The flow was unusually swift, so it was more work than your typical lazy float down the river. 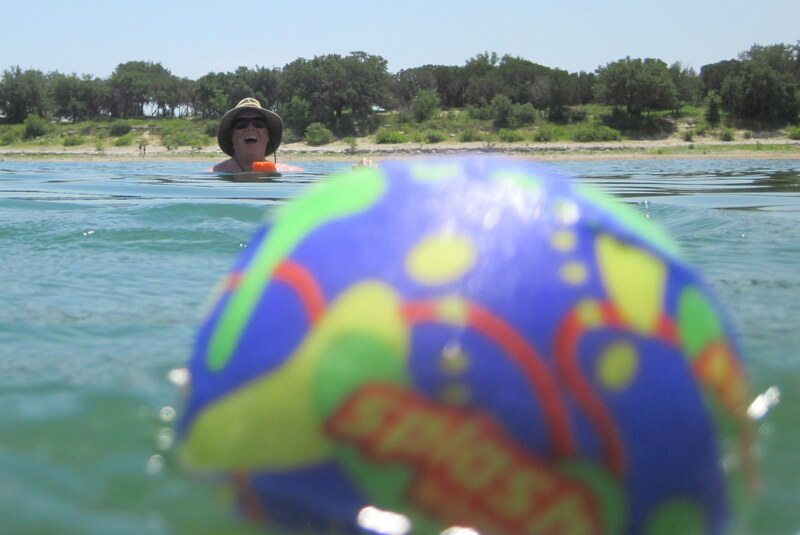 This is a shot just as I entered the chute at the rapids. I’ve never turned over before, but this time I did, and ended up losing my hat and sunglasses. My hat was found a bit down river, but my prescription raybans are gone for good. Oh well. But it didn’t dampen the fun. Can’t wait for the next float! Tonight Jen joined us for dinner at our favorite Indian restaurant. Afterward we came back to the house for a visit. 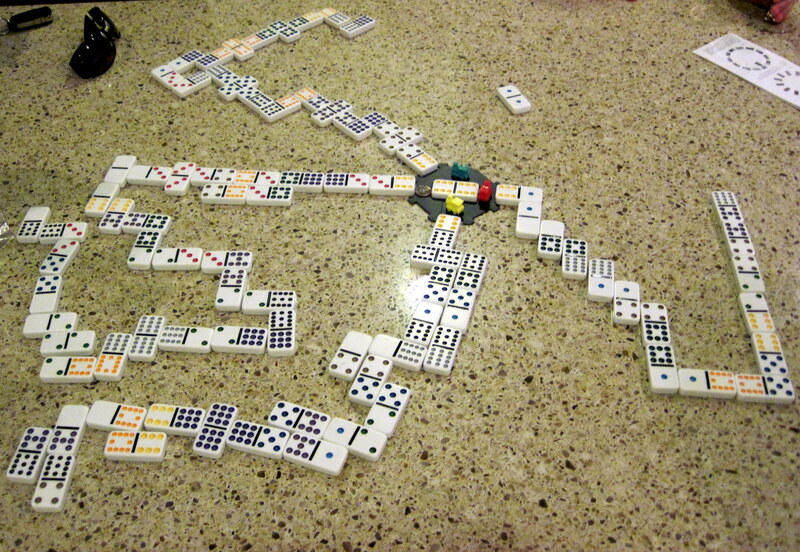 Rob and Jen introduced us to this domino game called Mexican Train. Not sure why it’s called that, but it’s fun. Monte won several times and I think Jen and I both won one. This was one of the more impressive set of trains we built. Once or twice a year some girlfriends and I book a day at the spa. We’ve been doing it for about 12 years now and it’s AWESOME. 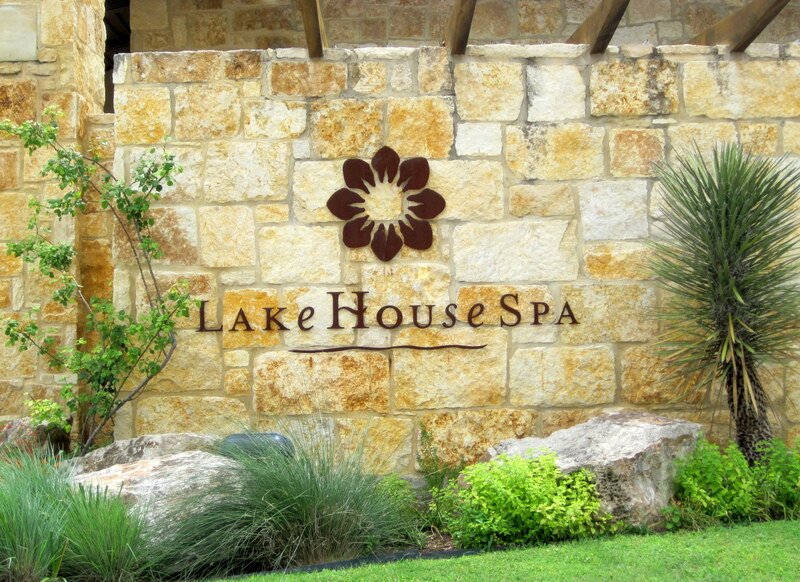 I had a fantastic, much needed massage… dissolving weeks of stress in about an hour. Up early this morning to get Laura and Lori to the starting line. 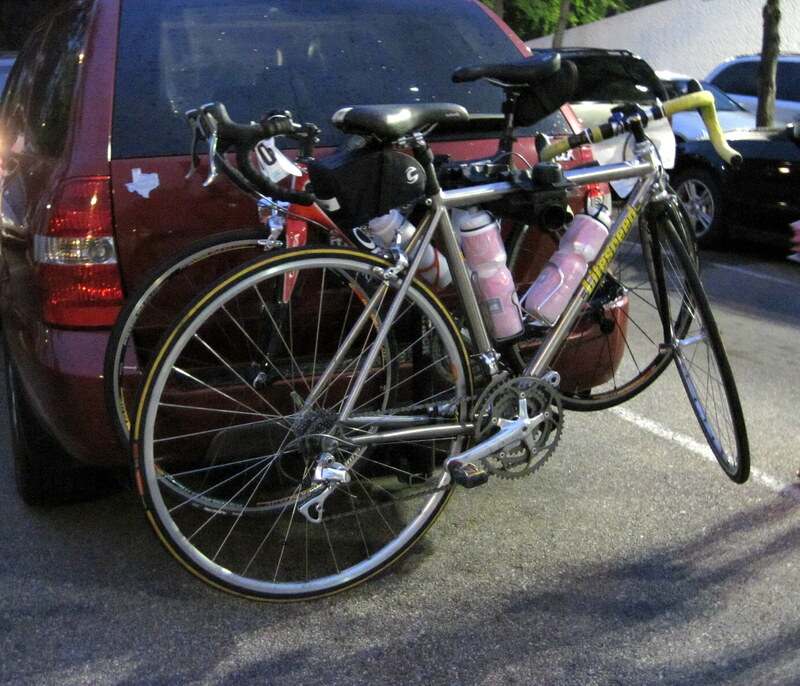 Maybe one of these days I should ride with them…. but then again, his sherpa thing is not a bad gig. We went to a reunion of sorts at Lori’s tonight, of some of the folks that worked and played hard in Boca in the early days. Simply could NOT keep these people from dancing (or whatever you’d call it). 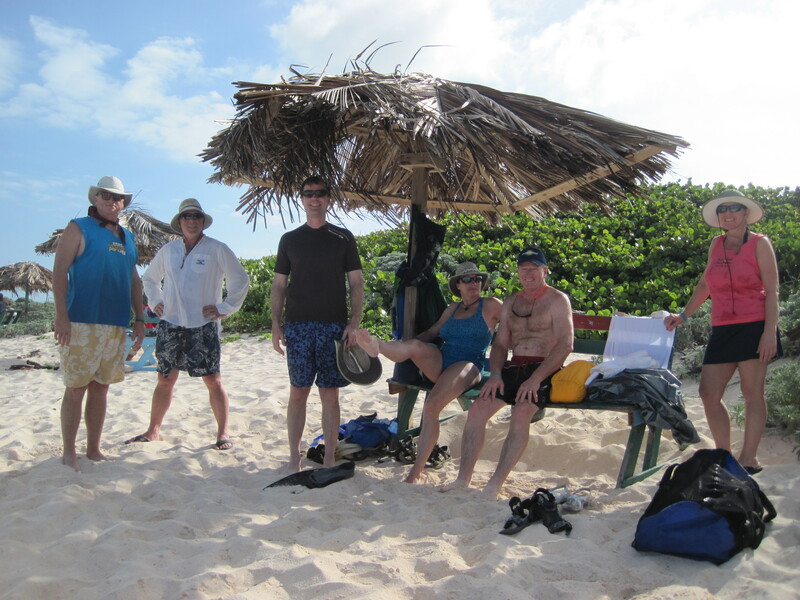 Saw Lori, Dave, Rudy, Jake, Eric, Laurie, Doray, Tom, David H, Wendy, Denyse and Lisa. Had a blast. Last night we sprang ahead for Daylight Savings Time. There are many things I love about DST, one is that we can play 9 holes in the late afternoon and finish before sunset. So we hightailed it over to Maurice Williams on this fine Sunday afternoon and walked 9. This shot is from the green at No 5, which has a good view of the new, changing skyline of Austin. It’s been a long time since we played. I hope we can sneak away after work a few times to play before it gets insufferably hot. Afterward, as we do after every round at Mo’ Willy, we stopped by the Posse East near the UT campus for chicken tacos and a pitcher. It was a good day. Anagada – it’s an island, but it’s not deserted! 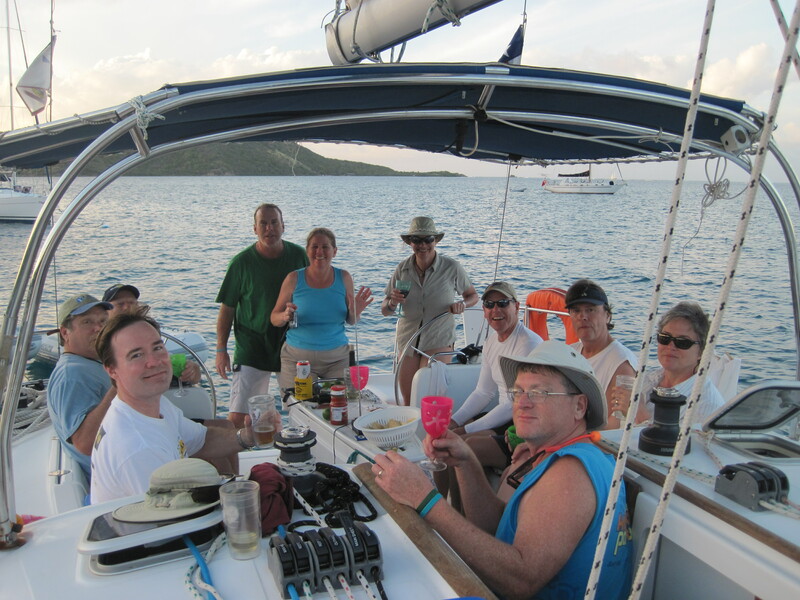 Happy Hour on Ada – Cheers! What a great cruise, great times, with great people. I’m so very lucky.